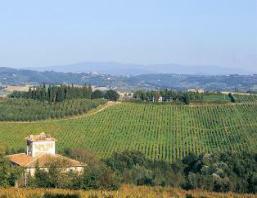 When Andrea Vecchione, proprietor of San Quirico, replanted his original 27 acres of vineyards more than 20 years ago, he was one of few in the area of San Gimignano who took a scientific approach to the task. The results have been so outstanding that his vineyards are now a prime source for select grafting. With their southern and western exposures, Andrea's vineyards have now doubled in size, while his approach to winemaking still has but one yardstick: quality. His winery is small but efficient and equipped to produce state-of-the-art wines. In 2004 San Quirico obtained USDA NOP (National Organic Program) certification for their organic products and the 2005 vintage was the first to be labeled as such.